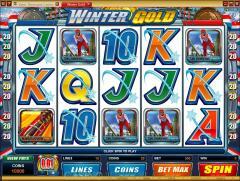 Winter Gold is a slot game from Microgaming based on the Winter Olympics. The Winter Olympics take place every four years but are staggered by two years from the Summer Olympics. In Winter Gold four popular events are depicted as symbols on the reels. These are Biathlon, Speed Skating, Ski Jumping and Bob Sleigh. The high value card symbols from Ace to Ten are also used. These have a snowflake running across them to indicate the winter theme. The Winter Gold Logo is the wild symbol and the Gold Medal acts as the scatter and bonus symbol. In the background to the reels one can see the distant snow peaks and the snow falling, the perfect setting for the Winter Olympics. Winter Gold allows players to manipulate all three betting options. The coin size can be varied from 0.01 to 0.20. Players can wager up to 20 coins per payline and enable up to 15 paylines. Whereas players may select the coin size and number of coins depending on their bankroll, they should always wager with all paylines enabled. This is because winning combinations pay out only if they occur on enabled paylines. The Winter Gold Logo is the wild symbol and substitutes for all symbols except the scatter symbol. It does not multiply payouts. 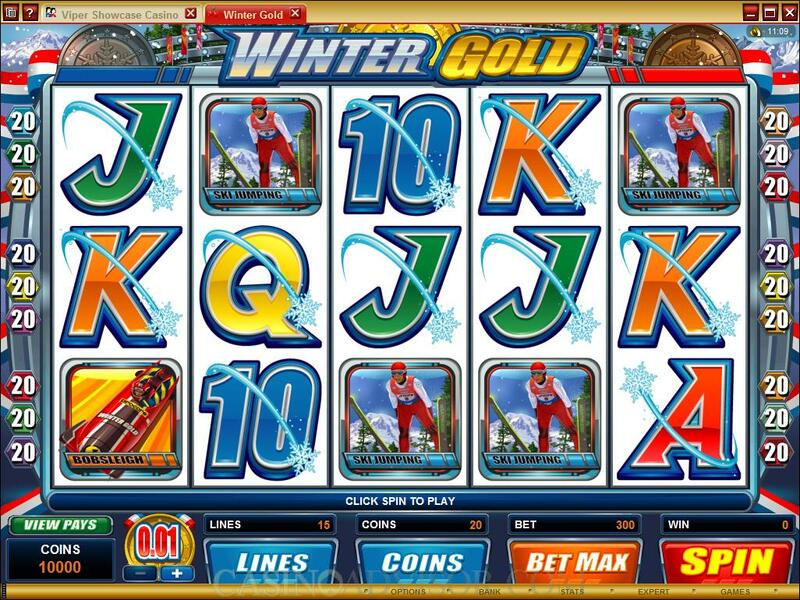 Five Winter Gold Logo symbols in an enabled payline result in the highest fixed jackpot of 5000 coins. The Gold Medal is the scatter symbol. Two or more scatter symbols appearing anywhere on the reels results in scatter payouts. Three or more scatter symbol anywhere on the reels trigger the Bonus Wheel Feature. The Bonus Wheel consists of eight slots. Two of these slots offer up to 20 free spins and two offer up to 18,000 credits. The remaining four take players to bonus games on the second screen. 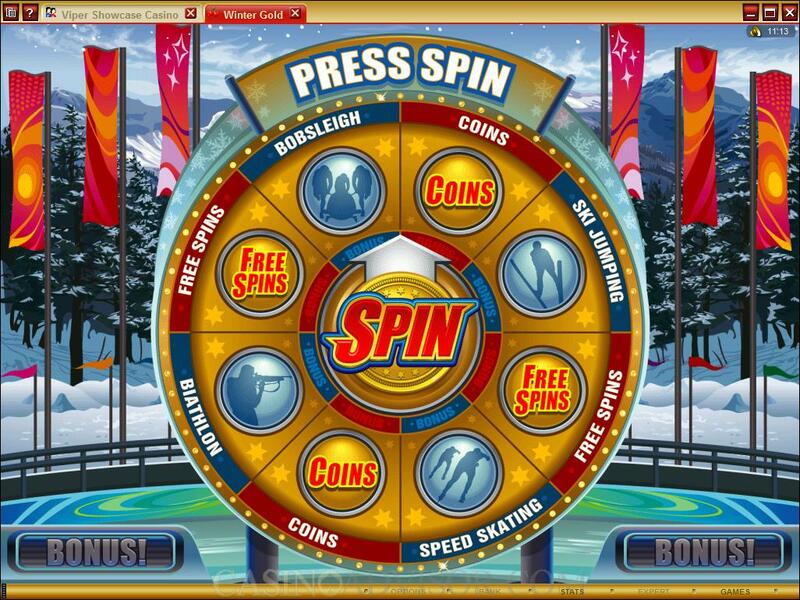 Each bonus game is based on one of the four winter sport events covered by the symbols on the reels. 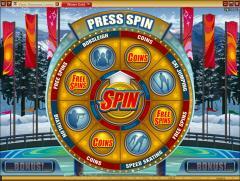 The player spins the pointer and it comes to rest on one of the slots. Players should hope that it comes to rest on one on the bonus games because these are an audio visual delight. The Speed Skating bonus game takes players to a skating rink. The player chooses his athlete and the race commences. The player receives payouts depending on the position of his skater in the race. In the Bob Sleigh bonus game four teams have registered their times. The player’s team then completes the circuit. All five teams are ranked according to their timings. The player gets bonus credits depending on the position of his team. The sporting events are shown with different camera angles and with announcements and the crowd cheering. It is like watching the sporting event on television. Interested in reading more detailed information about Winter Gold? If so Click Here for more details.